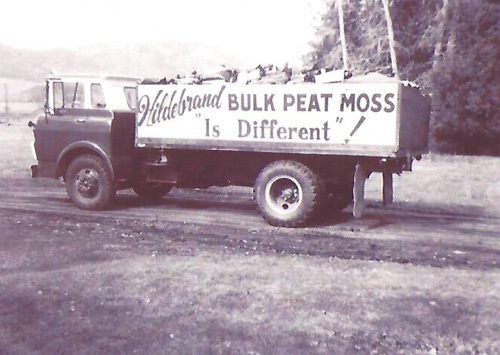 The old "Hildebrand Bulk Peat Moss" truck before the business name change to "Black Diamond Soil Services". After some years of search, Hildebrands developed a machine with 16 drive wheels that would not "bog down" on the peat moss. "Bog provides peat moss industry"
Starting with an idle query from visiting soils specialists as to the various types of soils he had acquired with his recently purchased farm, Jack Hildebrand of Grindrod, has built up a business out of his 100 acre peat bog that has already taken the finished produce to points as far afield as Southern Alberta. The same enquirers, after seeing the peat moss, placed small orders for what is now the well known product HBPM (Hildebrand Bulk Peat Moss) and the peculiar qualities of the moss from his peat bog, soon created a widespread demand, mainly among horticulturists and nurserymen. Jack and Marj Hildebrand moved to Grindrod from Grassy Lake, Alta., in 1961 buying Bill Monk's farm on Monk Road. The farm has acres of peat moss, the largest single bog in the Okanagan. They had intended to farm their new place, with a total of 153 acres, much in the manner adopted generally in the area. Some special crops were to be grown in the 100 acre tract that was at the time known to be an "amorphous granular" soil or peat type. Their original farming plans have been pretty well carried out but with radical changes incorporated because of increasing demand for this special type of moss. Peat moss generally thought to be decomposed matter, is really living plant, and can actually grown and build up as much as four inches a year. Peat moss will not grow in all areas. The Okanagan Valley has the right combination of conditions and climate to make it reproduce in abundance. The special salts, irons and acids in the soil preserve the moss and Hildebrand's variety was found to be very high in available nitrogen and calcium. After being processed for some two years, it is now ready for immediate plant use. Mr. Hildebrand gets 100 per cent recovery out of his peat bog, this being unusual, as most bogs have one foot on top that is covered with twigs and leaves. This is considered usually to be waste material. Another outstanding feature about Mr. Hildebrand's peat bog is that it is twenty feet deep in most places; usually peat peat bogs are only four to eight feet deep. Filling the orders wasn't easy. A natural bed of peat moss, or turf, is soft, and threatens literally to swallow up heavy equipment. A light tractor and manure spreader were first used, with loading by shovel. Then a wagon with four doughnut type tires was tried. Loading by shovel was replaced by a wheelbarrow and plank. All hand loading and unloading come to a halt with the arrival of a crawler with front end loader. 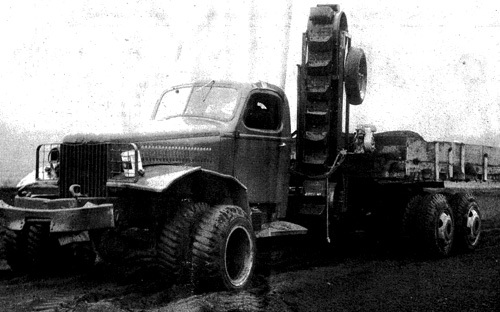 This was an improvisation of a three ton truck using 12 tires on the rear axle. The machine was originally made for World War II. Now the peat can be removed from the mine in large quantities. Hildebrand has a wide radius of buyers, extending as far as Southern Alberta, Pentiction and Kamloops, and some queries have come from Saskatoon.